For the fishing resort and former spa in San Saba County, see Bend, Texas § Sulphur Springs. "Just Play. Have Fun. Celebrate." Sulphur Springs derives its name from the fact that when the area was first settled, springs of sulfur water were abundant. Long before the first European-American settlers arrived, Native American tribes had occupied the areas around the springs and used them for their therapeutic value. The settlers also gathered around the springs, and the town developed around this area from the late 1840s. Eli Bib, one of the first European-American settlers, ran a store from his cabin, selling staples, whiskey, persimmon beer, and slabs of ginger cake. In 1849, Dr. and Mrs. Davis moved into the area. Dr. Davis envisioned the spot as a future city. In 1850 the residents organized the area's first church, the Methodist Episcopal. Construction of the church was completed in 1853. In 1852, the Presbyterian Church was organized. At that time, the population of the village was 441. In order to serve the growing group of people, commodities began to be brought in from nearby Jefferson. New stores were established. The village became a city in 1854 when the first post office was established. The city's name was originally "Bright Star". Mail to and from the city was delivered by the Pony Express. 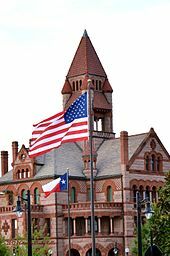 On May 18, 1871, the legislature moved the county seat of Hopkins county from Tarrant to Sulphur Springs, and the name "Bright Star" was removed from the postal directory. Local government organized slowly. The first known mayor was William A. Wortham. In 1854, Wortham had bought the Texas Star press and moved to Sulphur Springs. He, his brother-in-law, and Bill Davis established the city's first newspaper. The county seat had numerous newspapers. Echo Publishing Company was founded in 1897. It was the first steam-powered press in Sulphur Springs. After the first plant was lost to a fire, a new plant was constructed which used gasoline as fuel. In 1884 the Sulphur Springs Enterprise was founded. In the same year, James Harvey "Cyclone" Davis, a Populist (People's Party) US congressman, founded the Alliance Vindicator; it was published until 1901. John S. Bagwell bought the Hopkins County Echo in 1916. In 1924, the Texas Star was merged into the Daily News Telegram. The Daily News Telegram later was renamed the Daily Gazette and still later the Weekly Gazette. Eventually, all these newspapers were merged into the Sulphur Springs News-Telegram and the Hopkins County Echo, both of which still operate. In 1857 the city set aside 10 acres (40,000 m2) of land for Bright Star University. The Sulphur Springs District Conference High School began in 1877, established on Bright Star University land on College Street. In December 1882, the school became known as Central College. It was owned by the Methodist Episcopal Church. It was later renamed Eastman College and Conservatory of Music and Art under a new charter and after the leading professor. Before the year 1900, the college burned and Professor Eastman left the area. The First National Bank of Sulphur Springs received its national charter in 1855. It is now known as City National Bank. In 1857 the area's first steam-powered factory was established by the Bell brothers. In the same year, the Morro Castle was built on North Street. Its builders remain unknown. C. Denton was elected to lead the new city government, which was incorporated during the Reconstruction Era. During the Civil War, the town had lost its charter and had to be incorporated again by the state legislature. In 1868, federal troops moved into Sulphur Springs and occupied the city for a period of two years during Reconstruction, in an effort to protect freedmen after emancipation. Upon their departure and the end of the military occupation, A. J. Bridges was elected as mayor. The construction of a railroad line from Mineola, Texas, in 1872 stimulated growth in the city. Settlers were drawn by tales of the healing powers of the city's sulphur baths. Due to population growth, the springs of sulphur were gradually covered. None are active today. A rail was run from Jefferson to Sulphur Springs in 1879. The St. Louis, Arkansas & Texas Railroad (Cotton Belt) was built through Sulphur Springs in 1887 on its way to Commerce and Sherman. The next year the line was completed to Fort Worth, connecting the city to a major market. In 1891 the bankrupt railroad was sold to Jay Gould interests and renamed the St. Louis Southwestern Railway. An ice plant was built in 1887. The city's courthouse, which is still used today, was constructed in 1895. In 1904, wells were dug to supply the city with water. In the same year, a long distance telephone line was run to nearby Greenville. In 1889, the City National Bank was organized. After World War II, the city adopted a new council-manager type of government. It stimulated new programs. Industrialization brought new plants and factories to the city. The population has grown as a result. In 2016 it was estimated at over 16,000. The dairy industry was a major component of the local economy from the late 1940s through 1995. The Southwest Dairy Museum in the city features artifacts on the history of the dairy industry. The industry began to shrink largely because of declining milk prices, higher labor costs, and large corporations operating industrial-scale dairies. Large industries in the area today include Pinnacle, Ocean Spray, Grocery Supply, Jeld-Wen, Clayton Home Mfg., Flowserve, and others. For several months in 2012, Hopkins County enjoyed a very low unemployment rate at approximately 4.5% and 500+ jobs added. The city public library has two unique collections: the Leo St. Clair Music Box Collection includes more than 150 unique music boxes, and the Sinclair World War II Collection displays letters, pictures, and other World War II artifacts. The Southwest Dairy Museum and Learning Center depicts all facets of milk production and the history of the dairy industry. Its old-fashioned soda bar sells ice cream, sodas and light lunches to visitors. The Farm and Art Market is located downtown from May through October during the evening. In 2012, American Farmland Trust voted the market "America's Favorite Farmers Market". Coleman Lake and Park is a 186-acre (75 ha) park with waterfalls, trails, and tournament-rated ball parks. Imagination Mountain has a waterfall, with tunnels, slides and sandpits. Buford Park is a one-acre park with castle playground known as Kid's Kingdom. The local walking trail crosses Pea Vine Pinion pond. Hopkins County Museum and Heritage Park features 11 acres (4.5 ha) of historical buildings which have been relocated to the park for restoration and preservation. Activities at the park include people churning butter, blacksmithing, and cooking with a Dutch oven. Farther afield, Cooper Lake State Park, 15 miles (24 km) north of Sulphur Springs, has more than 2,500 acres (1,000 ha) of terrain and 19,300 acres (7,800 ha) of lake. Lake Fork Reservoir, renowned for champion bass fishing, is 15 miles south of Sulphur Springs. 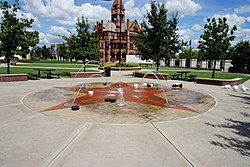 Sulphur Springs is at the center of Hopkins County, roughly halfway between Dallas and Texarkana. Interstate 30 passes through the south side of the city, with access from exits 120 through 127. I-30 leads east 38 miles (61 km) to Mount Pleasant and 100 miles (160 km) to Texarkana, while to the west it leads 30 miles (48 km) to Greenville and 79 miles (127 km) to Dallas. Texas State Highway 19 runs through the western side of Sulphur Springs, leading north 37 miles (60 km) to Paris and southwest 44 miles (71 km) to Canton. Texas State Highway 11 passes through the southern and western sides of Sulphur Springs, leading southeast 23 miles (37 km) to Winnsboro and northwest 20 miles (32 km) to Commerce. Texas State Highway 154 runs through the center of Sulphur Springs as Gilmer Street and Church Street, leading north 21 miles (34 km) to Cooper and south 27 miles (43 km) to Quitman. 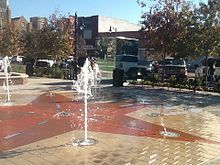 According to the United States Census Bureau, Sulphur Springs has a total area of 23.6 square miles (61.2 km2), of which 20.2 square miles (52.4 km2) are land and 3.4 square miles (8.8 km2), or 14.38%, are water. The city is part of the Rock Creek (White Oak Creek) watershed, which flows east to the Sulphur River, a tributary of the Red River. Sulphur Springs is considered to be part of the humid subtropical area. As of the census of 2010, there were 15,449 people, 5,959 households, and 3,987 families residing in the city. The population density was 867 people per square mile (314.6/km²). There were 6,654 housing units at an average density of 372.8 per square mile (140.3/km²). The racial makeup of the city was 68.4% White, 12.6% African American, 0.4% Native American, 0.5% Asian, 0.03% Pacific Islander, .08% from other races, and 2.1% from two or more races. Hispanic or Latino of any race were 15.9% of the population. In the city, the population was spread out with 28.8% under the age of 19, 6.7% from 20 to 24, 25.3% from 25 to 44, 23.8% from 45 to 64, and 15.5% who were 65 years of age or older. The median age was 36.2 years. For every 100 females, there were 92 males. For every 100 females age 18 and over, there were 88 males. Greyhound provides daily service to Dallas and points west, and Texarkana, Arkansas, and all points east. There is no bus depot in Sulphur Springs proper. The Greyhound buses stop at the Pilot truck stop. Amtrak does not directly serve Sulphur Springs. Its Texas Eagle train stops in Mineola, 36 miles (58 km) south of Sulphur Springs, with daily service to San Antonio and Chicago, and thrice-weekly service to Los Angeles. The city is served by a municipal airport. It was named Texas Airport of the Year for 2003 by the Federal Aviation Administration. Railroad service is provided by the Kansas City Southern Railroad, and the shortline Blacklands Railroad is based in Sulphur Springs. The city is served by the Sulphur Springs Independent School District. Sulphur Springs High School has the Wildcats as its sports mascot. Sulphur Springs Center Paris Junior College is a post-secondary educational institution located in the city, offering two-year college courses. Texas A&M University–Commerce, a major university of over 12,000 students, has a campus in the city of Commerce, 20 miles (32 km) west of Sulphur Springs. Samuel Benton Callahan, mixed blood Creek Nation politician, lived in Sulphur Springs before and after the American Civil War. Sophia Alice Callahan, daughter of Samuel Benton Callahan, noted author of novel, Wynema. Lived in Sulphur Springs during and after the American Civil War. ^ a b "Geographic Identifiers: 2010 Census Summary File 1 (G001): Sulphur Springs city, Texas". American Factfinder. U.S. Census Bureau. Retrieved March 15, 2018. ^ Kelsey, Mavis Parrott; Dyal, Donald H.; Thrower, Frank (2007). The Courthouses of Texas. Texas A&M University Press. p. 142. ^ "CITY OF SULPHUR SPRINGS, TEXAS : Comprehensive Annual Financial Report For the Fiscal Year Ended September 30, 2014" (PDF). Sulphurspringstx.org. Retrieved 25 January 2019. ^ Barone, Michael; Ujifusa, Grant (1987). The Almanac of American Politics 1988. National Journal. p. 1138.